Reid Carpenter loves being in the courtroom and advocating for his clients. Reid is at his best when he’s “on his feet” advocating for his clients in front of judges and juries. His experience includes multiple jury trials as well as arbitrations. 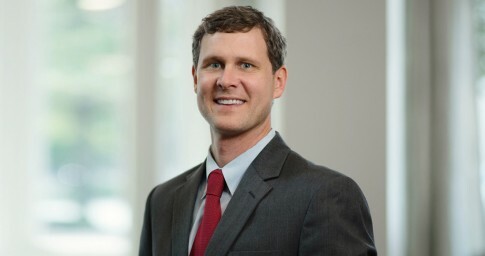 As a solution-focused attorney, Reid also prides himself on tailoring a defense strategy that is specific to each client’s unique situation and desired endgame, which often involves creative resolutions outside of trial. While Reid maintains a general litigation practice at Lightfoot, the majority of his experience falls in three key areas: natural gas, product liability and healthcare. His natural gas experience involves the regular representation of a natural gas operator in Alabama. His product liability experience includes the defense of several major manufacturers of industrial, agricultural and forestry equipment, and he has also handled several cases involving allegations of defective firearms and ammunition. The remainder of Reid’s practice is primarily dedicated to the defense of doctors and hospitals in medical malpractice litigation. Reid joined Lightfoot in 2010 after graduating from the University of Alabama School of Law. During law school, he was a member of the National Civil Trial Competition Team, through which he received the American College of Trial Lawyers Award and the International Academy of Trial Lawyers Student Advocacy Award. In addition, he was selected as a member of the Order of Barristers for outstanding oral advocacy and served as the career services representative for his class. Originally from Talladega, Alabama, Reid is an avid outdoorsman and enjoys fishing and spring turkey hunting. Obtaining summary judgment on behalf of a psychiatrist in a wrongful death medical malpractice case in Morgan County, which was successfully upheld on appeal by the Alabama Supreme Court. Obtaining summary judgment in federal court on behalf of a firearms manufacturer accused of designing, manufacturing and selling a defective revolver. Obtaining a defense verdict on behalf of an emergency medicine physician after a two-week jury trial in Colbert County, Alabama. The plaintiff alleged that the physician caused the death of her husband by failing to diagnose an aortic dissection. Defending an emergency medicine physician in a two-week jury trial in Calhoun County, Alabama. Obtained a defense verdict against allegations involving the failure to diagnose an esophageal perforation, which ultimately caused the patient’s death. Obtaining a favorable arbitration result for a telephone service provider in a suit brought on behalf of an attorney who claimed a significant amount of lost business profits as a result of his law firm being incorrectly listed in various directory listings and phone books.